Abi Scheid attempts a shot. 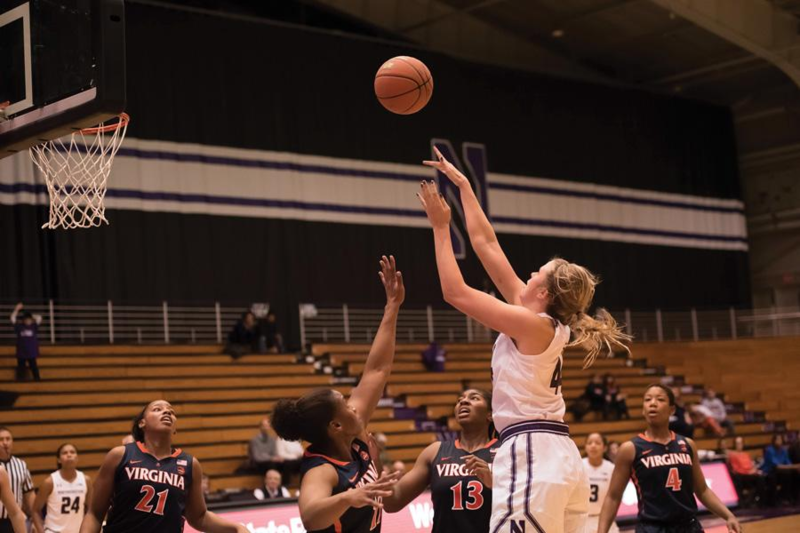 The sophomore led Northwestern with 17 points in a 63-57 loss to Green Bay on Tuesday. The high-pitched screams of more than 3,500 elementary school students helped will Northwestern to a competitive performance against No. 21 Green Bay on Tuesday, but the Wildcats were unable to avoid dropping their sixth game in their last seven outings. Up against the top defense in the country, NU (6-7) kept the game close but ultimately lost to the Phoenix (10-1) 63-57. The game was played at Allstate Arena, replacing the Cats’ home this season at Beardsley Gym to accommodate the larger crowd. On Field Trip Day, a yearly women’s basketball tradition, students from across the Chicago area attend an NU women’s basketball game. This year, those kids provided what will likely be the most boisterous home crowd the Cats will have this season. “I love playing the Field Trip Day, it’s great to have the fans come out, the kids come out,” coach Joe McKeown said. They even got an unexpectedly close game, though it didn’t appear to be going that way at the beginning. Green Bay came into the game with the best defense in the country, holding opponents to just 46.1 points per game. That defense was on display early, as NU could not score for the first five minutes of the game. In the second quarter, however, Scheid got the Cats offense rolling, scoring 11 of the teams’ 19 points in the period. NU was able to cut the lead to 2 during a sloppy third quarter, and kept the deficit manageable until the Phoenix pulled away halfway through the final period thanks to a flurry of 3-pointers that extended their lead to 12. While the Cats clawed back to within 5 late, they could not come up with enough plays down the stretch to complete the comeback. Freshman guard Jordan Hamilton missed her second straight game with a lower-body injury, and her status going forward is unclear. Her absence has left point guard duties to sophomore Byrdy Galernik, who played 39 of 40 minutes after sophomore forward Bryana Hopkins struggled as an emergency point guard in an ugly loss to Missouri State on Saturday. Galernik took advantage of her increased minutes, keeping the offense organized for most of the game against an elite defense and scoring a career-high 13 points to go along with five assists. Still, Galernik struggled with turnovers, committing a team-high four on the day. On the other side, Green Bay guard Allie LeClaire hurt NU all day long with her game-high 22 points and her 4-of-7 shooting from 3-point range. The Cats have one more non-conference game, against Eastern Illinois on Friday, before they head into Big Ten play.